NIS is an accredited asbestos removalist for Telstra, Tandem (ISGM), NBN, Visionstream and Servicestream. 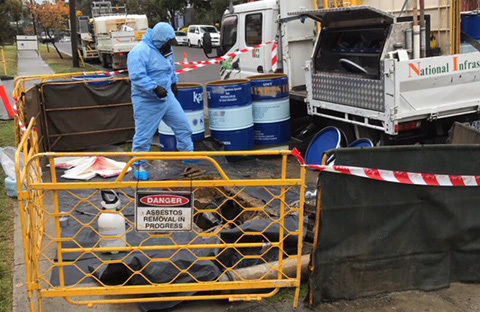 We hold a B Class ‘Non Friable’ Asbestos removal license with WorkSafe Victoria and an EPA Prescribed Industrial Waste vehicle permit for the safe transportation and disposal of asbestos. Under our license, there is no limit to the amount of Asbestos Containing Material (ACM) we can remove. The NIS team includes experienced A-Class asbestos removalists. These highly experienced technicians continually review and inform our processes, keeping our staff safe at all times. NIS can remove asbestos from telco pits, homes, sheds, commercial buildings, factories and fences.